SBI PO exam is held every year to appoint Probationary Officers in various SBI branches across India. The exam is generally perceived to be tougher than any other competitive banking exams in India. The reason being that SBI releases minimum cut-off marks for every SBI PO exam every year. 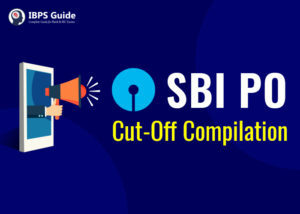 The cut-off mark is the minimum section wise score that a candidate needs to achieve in each SBI PO exam level in order to qualify for further rounds. The cut-off score for every round vary from each other and needless to say, gets tougher will every level. Hence candidates need to ensure that their preparation is up to the mark. Given below is the year-wise cut off marks for SBI Prelims and Main exams from the year 2013 to 2018.